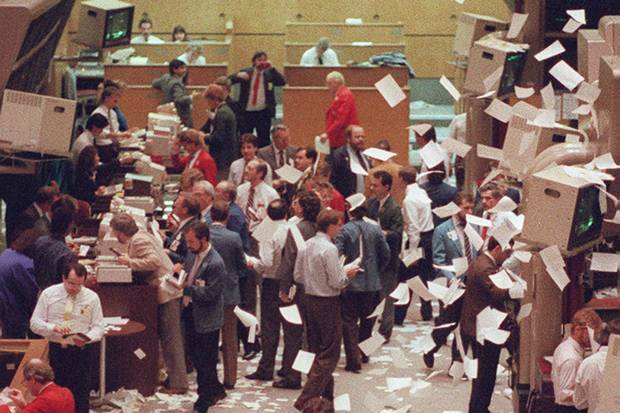 Paper flies through the air as trading closes at the Toronto Stock Exchange on Oct. 19, 1987, better known as Black Monday. Gluskin Sheff + Associates Inc. chief economist David Rosenberg began his Bay Street career on Black Monday. Fresh off the bus from Ottawa, where he had spent the previous three years in a "cushy civil-service job" at Canada Mortgage and Housing Corp., Mr. Rosenberg put on a new brown suit purchased in a two-for-one sale and walked into the office around 6:45 a.m., ready for his future. Within hours, the then-26-year-old had witnessed one of the worst single-day market meltdowns in history. "It was absolute pandemonium," Mr. Rosenberg recalls of his first day as a junior economist at Bank of Nova Scotia on Oct. 19, 1987. "I had never even stepped onto a trading room floor before." He spent much of that day doing market research and watching his bosses, senior economists Warren Jestin and Aron Gampel, argue with conviction that what was unfolding that day was "a liquidity event, not a fundamental event." It turned out to be the right call, given that the markets bounced back. The next recession didn't happen until three years later, for different reasons. Another clear memory Mr. Rosenberg has is how level-headed both Mr. Jestin and Mr. Gampel were on that day 30 years ago. "For the first time in my life I thought, 'Wow, you can actually be cool and be an economist at the same time.' These two guys had ice in their veins," Mr. Rosenberg says. "They kept on saying the Fed was going to pump the system with liquidity left, right and centre, and that's exactly what happened. I learned early on how important Fed policy is, and the difference between a correction and a bear market." While the global financial crisis in 2008-09 was much worse, over a prolonged period, Black Monday was still "plenty scary at the time," Mr. Rosenberg recalls. He left the office that day after 8 p.m. tired, but with his eyes wide open. "In retrospect, even to this day, it was such a phenomenal experience, to start my career on that particular day. I learned so much." Mr. Rosenberg got another valuable tip that day, something more subtle about surviving on Bay Street. "At the end of the day, Warren and Aron said, 'We have a piece of advice for you,'" Mr. Rosenberg remembers. "I thought, 'this is awesome.'" That advice? "They said to me, 'Never wear a brown suit' … I guess it just wasn't Bay Street enough." Luckily, the second suit he purchased for that job was blue. He never wore that brown suit again. As the havoc in markets was just getting under way that Monday morning 30 years ago, Tom Bradley thought he better speak up about some buying opportunities. As a young stock analyst at Richardson Greenshields, an investment dealer eventually bought by RBC Dominion Securities in 1996, Mr. Bradley dutifully informed the firm's traders that he was seeing good value in the 20 or so equities he was covering. None were facing any major company issues, but all were hemorrhaging value. "I quickly realized nobody cared about value or fundamentals," Mr. Bradley said. "Everybody was in survival mode. So I took a chair on the edge of the trading desk late in the morning and watched the day unfold. I didn't move. There really wasn't anything to do." As the losses mounted and the bottom of the market was nowhere to be seen, putting together trades became more and more difficult. And Mr. Bradley would clearly need to re-evaluate every stock within his purview. One of them was Investors Group, which declined by 27 per cent over two trading days. Thirty years later, as president of Steadyhand Investment Funds, that day is "imprinted on my brain," he said. The biggest lesson he took away from Black Monday is to be open-minded about the range of potential outcomes. In 1987, few thought a single-day sell-off of that magnitude was possible. "I think it made me a better investor," Mr. Bradley said. "My best times are in frantic, panicky markets. I've always done well, added value and made good buys in those periods. But it's probably scarred me a little, in the sense that I don't handle prosperity as well. I'm probably a little too quick to get out after I've had a big win." History may have relegated Black Monday to a single-day event, but the days prior were pretty ugly themselves, with the Dow Jones industrial average down more than 10 per cent in the three trading days before the weekend. "There was a sense of foreboding that a long-anticipated correction was here, that fear was setting in," said Kim Shannon, then a trader-analyst with Royal Insurance. "You went into the office on Monday on high alert." As the morning quickly justified that anxiety, it became clear that access to information was going to be a big problem. Because bid-ask spreads were so wide, many exchanges had difficulty opening. So traders could not get an opening number for the indexes for the first half-hour of trading, Ms. Shannon said. And when the index values were finally disclosed, they had dropped so much that waves of stop-loss orders were triggered. That intense selling pressure subsequently resulted in trading halts. "The systems kept getting overloaded, so you'd be trading blind. It was chaotic," Ms. Shannon said. Much of the day was spent waiting for information in astonishment at the unprecedented velocity of the crash, fixated on their Quotron machines, which displayed stock quotes on electronic screens. Much of the blame for Black Monday would be placed on portfolio insurance, which used futures contracts to insulate against market losses. But in widespread use, the tool triggered a spiral of selling once the decline gathered momentum. "When something like that gets too popular, it can have unintended consequences," said Ms. Shannon, now the president of Sionna Investment Managers in Toronto. One big lesson she took away from Black Monday is to be leery of the market's fixation on innovative products and strategies, particularly before they have been tested through a serious market dislocation. "We're cognizant of the limitations of something that's novel, shiny and new in the market," she said. Here are the front pages of The Globe and its business section the day after Black Monday. The following article – on the scene from Toronto bars after the bloodbath – was published on Oct. 20, 1987. Deep in the bars beneath the Toronto Stock Exchange, they started creating the legends as soon as the markets closed. "It's 1929 all over again," one man muttered into a telephone from the bar at Sammy's, the dimly lit haunt of many Toronto traders. Over in the Cafe Marta, another bar just a few doors away, several clutches of serious-looking men and women were talking about rumors of suicides in New York City and bankruptcies in giant U.S. brokerage houses. But at the end of each tale, great guffaws erupted from the bar. "Oh, this is all the idle gossip you expect to hear. None of it's true," one man said, looking over his shoulder and winking. Indeed, with each beer dispensed, the instant folklore seemed to grow more elaborate. And though the stories may have been glum, the people telling them were not. No one was storming into the bars, crying that the sky was falling. "You need anyone for a paper route?" joked David Tuck, a trader for Gordon Capital Corp., when asked how he felt at the end of a day that saw share prices plummet on stock exchanges all over the world. "Is your picture going to go in the 'help wanted' section, David?" one of his friends bellowed from across the bar. Some traders were more reflective, predicting that the stock market's performance yesterday probably would have a serious effect on investor psychology for some time to come. "A lot of people have never seen a bear market, especially one of this magnitude," said John, a trader whose company does not allow him to disclose his surname to reporters. "Investors' confidence is just going to get worse and worse and you're going to see a lot of people avoiding the stock market." But others cautioned against this scenario, urging friends to avoid words like "panic" or "crash." "The veterans of the business have seen this before," said one man who, like many others in the bar, asked that his name not be used. He blamed computer trading and the bull market of the past five years for the radical plunge of the markets yesterday. "In the past, things could fall only as fast as the traders' legs could go - now you just push a button … and in a bull market, it's punctuated by reactions, but they're violent reactions." Most of the people asked for reaction yesterday saw no point in lamenting the market's performance, arguing that it was too soon to tell whether traders and brokers would suffer long-term or permanent damage from one week of erratic market behavior. "The sun's going to come up tomorrow," Ken McConachie, a trader for Wood Gundy, said. Mr. Tuck agreed. "We can't tell anything yet. But we know that if this is a trend, then we're all in trouble."